You may have caught this picture going around the interwebs. 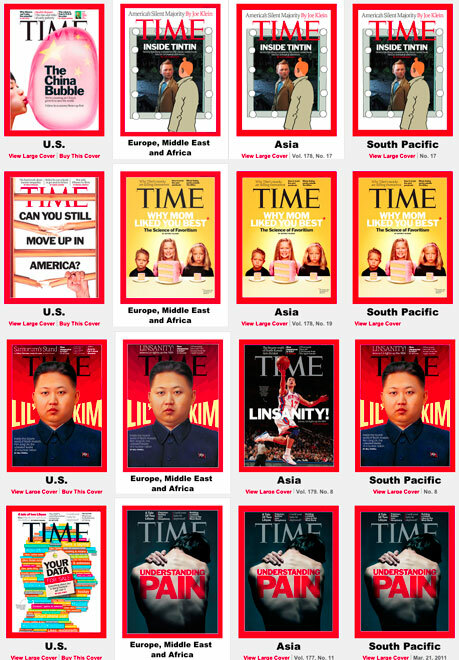 It compares Time magazine’s covers in the United States with those from around the world. It didn’t take too much searching to find weeks in which the vacuous American cover can be unfavorably compared with alternative serious ones from around the world. Before we get too depressed about the state of news in the United States, first let’s note that it’s not impossible to cherry pick the other way. Call me crazy, but I suspect the impending economic bubble in China might be more important that Steven Spielberg’s incarnation of French comic book adventure Tin Tin. I suppose we shouldn’t be too shocked that Asia is more interested in Basketball sensation Jeremy Lin than Korea’s new leader. So is all this a liberal media conspiracy to dumb down America. Doubtful. Conservative media seems equally sensational, choosing instead to scare us with exaggerations. (Don’t miss the doctored photos on the linked page.) The media hasn’t failed us; we have failed the media. Journalists from Time to Fox have bills to pay and a boss to satisfy. They do this through readership and viewers and hard news is not always as entertaining as scandalous articles, or puff pieces. The examples above show the problem is true around the world, even if it may, indeed, be worse, or more frequent, in the U.S.
“What Makes a School Great” than “Pakistan’s Despair”. It’s easy to judge the media for feeding us banal stories instead of those important beyond our own backyards, but we consumers are the ones to blame. Living fat and lazy in the world’s biggest economy makes one more interested in a new iPad than what thousands of workers had to go through in order to make us one. Those workers are far from the couch and and the new iPad will stream movies from the same couch to the flat screen in the living room. Of course, it’s sad that in this free nation, we’re equally free care or be disinterested, but relax, it’s not the media forcing this on us and the problem isn’t even as bad those other covers show. Meanwhile, if you don’t like Time magazine or Fox News, don’t hesitate to vote with your clicks. Check out The Economist, or, I don’t know, maybe, just get your news from blogs….